Use the Connect to SQL Server dialog box to connect to a Microsoft® SQL Server™ database. UN-REGISTERED WILL APPEAR UNTIL YOUR COPY HAS BEEN REGISTERED. Specify the name of an instance of SQL Server to which you want to connect. Display the list of active SQL Server database servers on the network. This list only displays instances of SQL Server on Windows NT. This functionality is not available on computers running the Microsoft Windows 95 or Windows 98 operating system. UN-REGISTERED copies are limited to (local). In order to run the demo you must have a local instance of Microsoft SQL Server running on the machine in which the UN-REGISTERED copy is being ran. The SQL Server drop down list will be populated with the instances of SQL running on your network, once registered. You can also type in a domain of an instance of SQL server, for web hosted instances. Default connection: (local) Your local instance of SQL server on the same machine your executing SQLDataLayer. Specify the type of authentication to use when connecting to the database server. Windows Authentication Specify that SQL Server will use the Windows user information to validate the user. This option is only available when connecting to an instance of SQL Server on your local area network. The client needs to be part of a Windows domain or workgroup. The user needs to be validated as a Windows user before access is granted. SQL Server Authentication Specify the use of standard SQL Server security validation. This is the default and only available option for an instance of SQL Server on the Windows 95 or Windows 98 operating system. It is optional for an instance of SQL Server on Windows NT, XP, 2000, 2003. 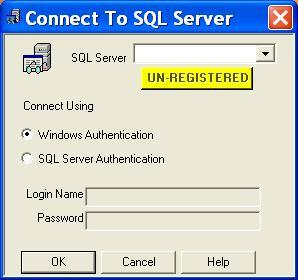 The login must be added to the SQL Server before a user can log in. Login name Specify a login recognized in SQL Server. Password Specify the password for the login name.